The Kissinger KlavierOlymp is an international piano competition that annually offers six young talents the opportunity to present themselves to the experienced Kissinger audience in recitals and concerts. 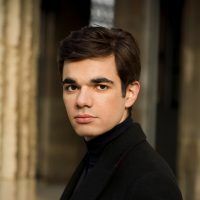 As a participant in the Kissinger KlavierOlymp last year, Jean-Paul Gasparian will be guest at the Kissinger Sommer this year. After a masterclass with the old master Menahem Pressler, this year’s mentor of the young up-and-coming artists, he presents Chopin’s Polonaise-Fantasy in A-flat major and the Ballad no. 4 at the recital on June 24th. Gasparian interprets Chopin’s works with emotional complexity, technical brilliance and astonishing maturity for his youthful age.